The Weber Style Small Vegetable Basket is the easiest way to cook vegetables or stir-fry meat on your barbecue. 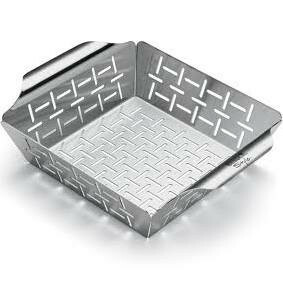 The new Weber Style Small Vegetable Basket is perfect for side dishes, plus the basket fits easily on the Weber Q. The Weber Style Small Vegetable Basket is the easiest way to cook vegetables or stir-fry meat on your barbecue. The new Weber Style Small Vegetable Basket is perfect for side dishes, plus the basket fits easily on the Weber Q. This vegetable basket features an innovative design that prevents small pieces of food falling between the grill's slats whilst still allowing that delicious smoky barbecue flavour to permeate. Quick and simple to use, try cooking BBQ vegetables the hassle free way with this high quality and stylish Stainless Steel Basket.